The Wheatsheaf Inn015395 68938work Restaurant with RoomsIn the heart of the picturesque village of Brigsteer, The Wheatsheaf Inn offers superb food, great real ales and a fantastic range of wines. Refurbished with considerable care and attention, the Wheatsheaf is just three miles from the medieval market town of Kendal. Six newly opened cosy bedrooms are situated on site. We are family, walker, cyclist and dog friendly too. The historic inn is situated at the foot of Scout Scar, with its stunning panoramic views and on the edge of the damson-growing Lyth Valley. Parts of the Wheatsheaf date back to 1762 and it originally was three cottages with a shoeing room for horses. The premises then became an alehouse and it was first licensed in the early 1800s. Our 6 newly opened bedrooms are all different, offering a choice of doubles, twin or king sized beds depending on the room. Room 4 is our Family room with a pop up single bed, and Room 2 our bunk room is a fun option for either friends or children. The Loft room, Room 6 is a cosy small double with a sloping roof and has a bath. All other rooms have showers. With carefully selected furnishings, lovely Bath House toiletries, tea & coffee facilities, and a freshly cooked breakfast to wake up to, you’re sure to feel at home. We look forward to welcoming you! 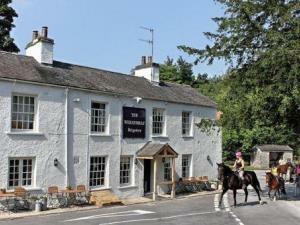 The Wheatsheaf Inn sometimes limits bookings to 2 or more days. Large double room can be split in to twins, extra bed with extra charge, pets welcome at extra charge tea and coffee making facilities, ensuite shower room, colour TV. Breakfast included. Extra supplement of £10 charged for pets. Have already recommended the Wheatsheaf to friends and hope to return before too long. 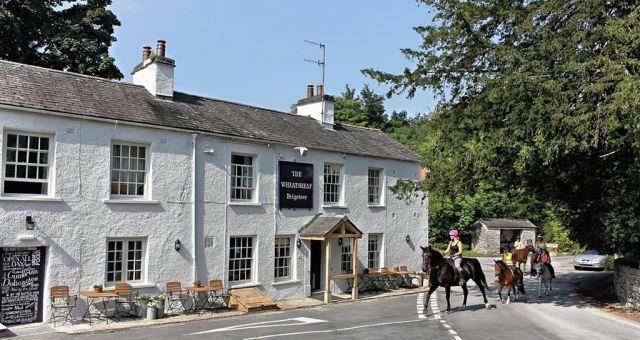 In the heart of the picturesque village of Brigsteer, The Wheatsheaf Inn offers superb food, great real ales and a fantastic range of wines. Refurbished with considerable care and attention, the Wheatsheaf is just three miles from the medieval market town of Kendal. Six newly opened cosy bedrooms are situated on site. We are family, walker, cyclist and dog friendly too. From junction 36 please follow the signs for barrow which will take you on the A59 follow this until you see a sign for Brigsteer which is approximately 5 miles turn up and follow the road up Whetstone lane for approx 1 mile once you get to the top of Whetstone lane take a left on to Brigsteer road follow this road for approx 1.5 mile until you see the pub in front of you. All answers have been based on the building as a whole pub being downstairs and rooms being up 2 flights of stairs these are not suitable for people with disabilities. However the pub has a disabled parking space and disabled toilet with 2 grab rails and an emergency pull cord.